At the two-year anniversary of hurricane Sandy, PortSide NewYork is telling our Sandy story, a story largely hidden, like so many in Red Hook. We believe our story offers hope and guidance for the future. That’s because our maritime perspective explains how we knew to prepare for Sandy, made us available to help Red Hook’s Sandy recovery, and is a knowledge base we want to share to make you safer from floods in the future. 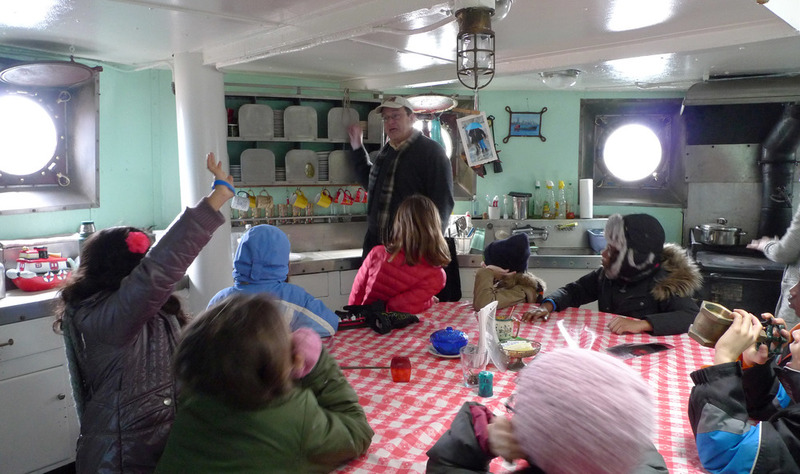 Thursday, 10/25/12, 1pm, Sandy minus 4.5 days, PortSide’s crew said good-bye to a class trip of first graders visiting the MARY A. WHALEN and started hurricane prep, punching our way thru the list of what we did for Irene the year before. During the next four and a half days, we traded strategies with historic ships and modern workboats around the harbor. 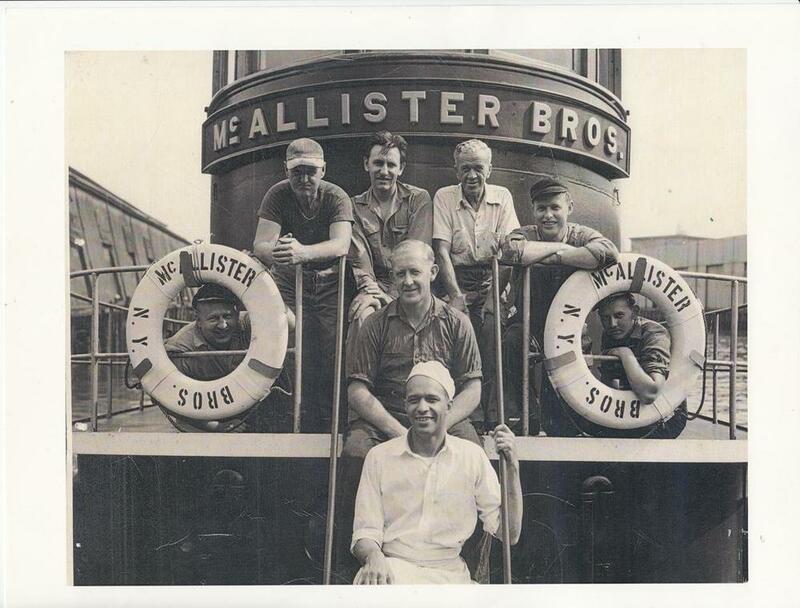 We all laid in food, water and fuel; tested generators; and moved our boats to safer places. PortSide curator Peter Rothenberg, shipcat Chiclet and Director Carolina Salguero are storm crew on the MARY A. WHALEN. Ashore in Red Hook, things were different. Sunday night, Sandy minus 24 hours, an email blast went out telling Red Hook which bars will be open and what movies are being screened. Carolina worried, “Is the community ashore prepping for Sandy? Has anyone evacuated?” PortSide’s maritime world felt separated from neighbors ashore by more than the containerport fence. 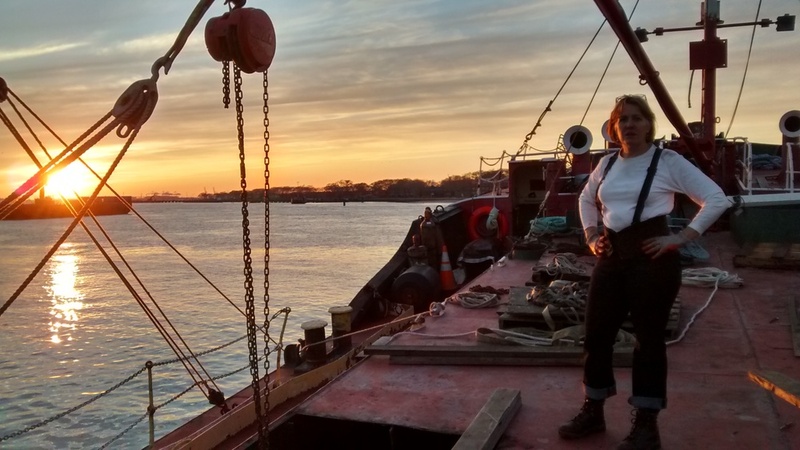 Due to preparations, our ship MARY WHALEN safely rode out the surge with our office aboard, enabling every form of Sandy assistance we delivered to Red Hook afterwards. Peter and Carolina came ashore on Wednesday afternoon to discover a devastated Red Hook, and immediately decided that PortSide’s urgent search for a publicly-accessible homeport was flooded to a standstill and that we would help Red Hook until waterfront sites recovered enough for us to resume real estate talks. What made that work possible was the selflessness of three people PortSide is honoring at our fundraiser on Tuesday, October 28 at Hometown. Victoria Hagman donated Realty Collective’s storefront and utilities at 351 Van Brunt, despite suffering extensive flood damage herself. 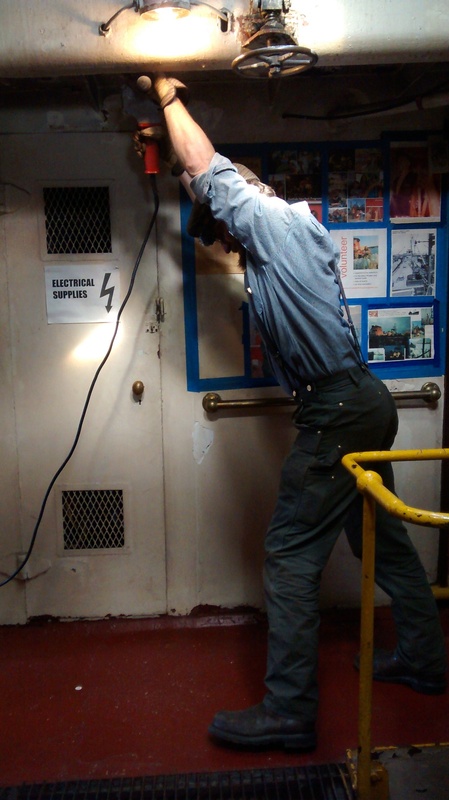 Park Slope electrician Danny Schneider walked into 351 and offered free labor. PortSide coordinated his work, and Danny reports that he inspected and certified 60 buildings and repaired some two dozen for just the cost of parts. Our third honoree, our Curator Peter Rothenberg worked both ends of PortSide’s recovery story, the prevention that saved the MARY WHALEN and the aid work after the storm of setting up and running 351. Peter, Carolina and Dan Goncharoff of PortSide ran 351 for a month and then continued a virtual aid station and other recovery efforts out of view. In April 2013, PortSide won a White House award for Sandy recovery work, and in July, the New York State Senate honored our work. Carolina began attending resiliency conferences. 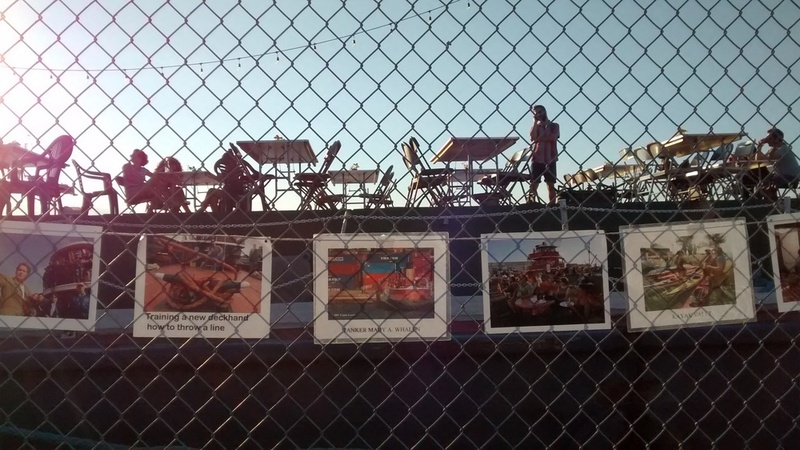 Summer 2013, she was asked to become a member of Red Hook’s NY Rising committee to create local resiliency plans. PortSide staff and interns did research supporting the committee (which includes bone, two, three, and four and several pages on our website) during the committee's eight months of work. One of Carolina’s NY Rising goals was to inject maritime issues into the discussion, hoping the State NY Rising process could influence a state agency, the Department of Environmental Conservation (DEC), so waterfront infrastructure in NYC can be more repaired and built for both resiliency and everyday operations. Carolina also proposed the solar-powered emergency lights for NYCHA housing which are in Red Hook’s plan and are being considered for other NYCHA developments. “I think the NY Rising committee work is good. Red Hook distinguished itself for what we put in our plan,” says Carolina; but plans are hidden assets for most people until they are built. 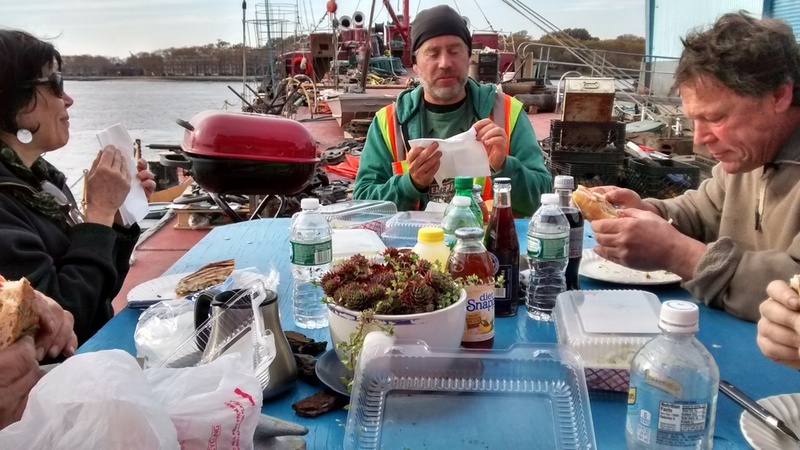 Looking back on PortSide’s two years of Sandy-related work, for the sake of Red Hook’s planning better for the future, we would like to talk about some hidden Sandy stories of need and success we found in the course of our recovery and resiliency work. PortSide’s recovery work helped many people who don’t get media coverage and whose cases deserve more attention: People without an advocacy group, without on-line fundraising. People who aren’t comfortable using computers and needed Peter’s help to complete digital forms. People in mixed-use buildings that don’t fit FEMA homeowner funding guidelines. Renters who are not in NYCHA, and so are not in the media and political spotlights. Seniors, immigrants. People whose divorce, estate and tax situations complicated filing for aid and kept them from speaking up in public meetings. People who are private about their needs in general. We learned that some affordable flood prevention was possible: The owners of Metal & Thread used a few hundred dollars of hardware store supplies to keep water from coming into their storefront and through the sidewalk hatch -- though their cellar suffered water leaking through the foundation from the empty lot next door. Some tugboat crews saved their cars by moving them from Erie Basin to the second floor garage at Home Depot, above surge level. IKEA’s contribution needs more attention. IKEA gave and gave and got no media coverage until the Sandy’s one year anniversary when their $250,000 investment in solar powering the Rec Center netted some articles. Inland Red Hook is so disconnected from maritime Red Hook that the latter’s role in recovery is not discussed. For example, Jim Tampakis’ business Marine Spares was significant in pumping out the Brooklyn Battery/Hugh L. Carey tunnel. Vane Brothers provided hoses to the Hess fuel terminal at the foot of Court Street so home heating oil could be delivered. Both firms did that despite flood damage to their offices and mechanical shops. PortSide feels the gap between inland resident and mariner is acute when we heard residents say “They told us to evacuate for Irene but nothing happened” and “I didn’t know there were two high tides a day.” We conclude that people ashore poorly understand marine weather reports and don’t know where to get them. In comparison, mariners understand how to live with water, and how to prepare for hurricanes. They do the post-flood work of pumping tunnels, building ferry terminals and running emergency ferries, fixing bulkheads, clearing the harbor of debris so ships can import products as diverse as fuel, orange juice, new cars, bananas. To bring maritime voices to people ashore, PortSide plans programs to help folks develop coastal living and flood prep skills, such as educational events with actual mariners, exhibits, and creating a children’s book with our shipcat Chiclet as a resiliency narrator talking about riding out Sandy on the tanker. Our ship is a great tool for this. 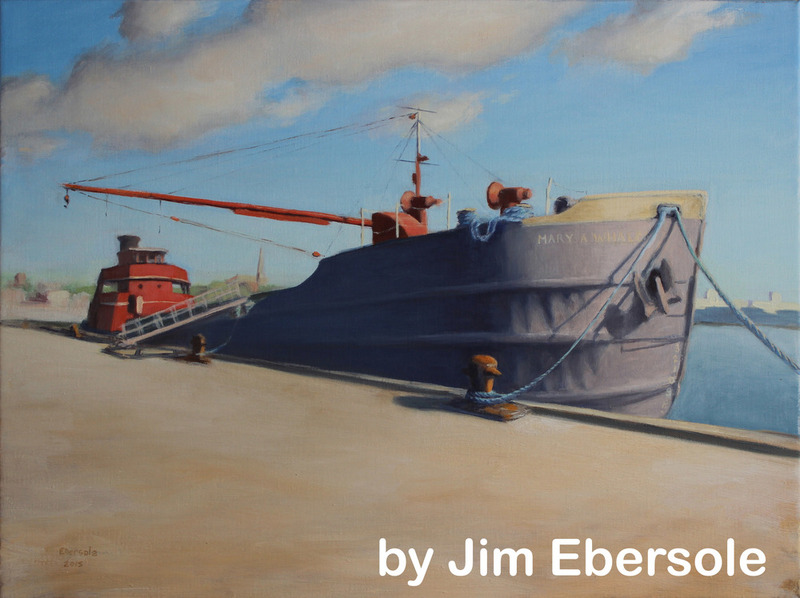 Our tanker MARY A. WHALEN is now a maritime symbol of resiliency, in contrast to the tanker JOHN B. CADDELL, Staten Island’s symbol of Sandy, which went aground and had to be scrapped. A hidden Sandy story PortSide feels acutely is that of our own Sandy damages. 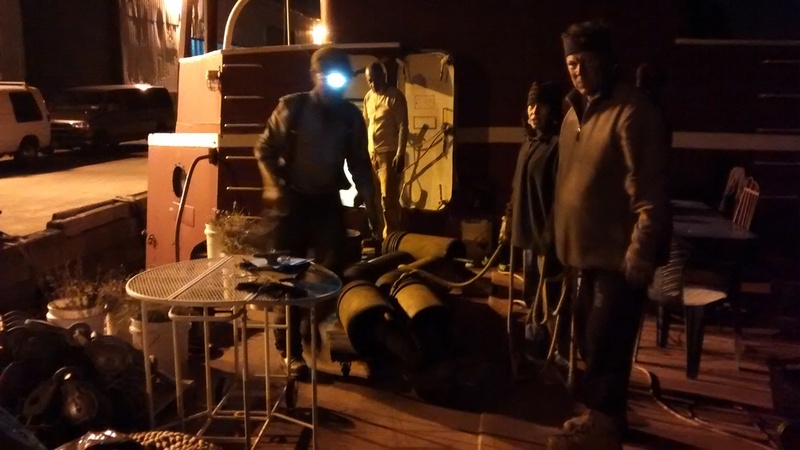 An electrical short left us facing thirty-five nights of relying on flashlights and one 15-amp extension cord attached to a little gas generator. 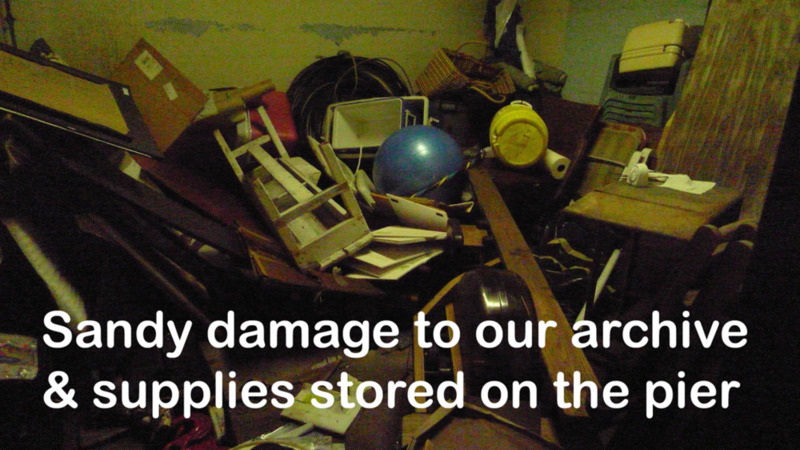 Sandy damaged the Sheepshead Bay house of our staffer John Weaver keeping him home for many months. Everything PortSide had off the ship (antique crane, 60’ dock, electrical transformer, restoration engine parts, historic artifacts and documents, special event equipment and furniture) was flood-damaged or floated away. Our FEMA worksheet totals some $340,000, and we are still deep in that paper chase, starting six months late because we were misinformed that we don’t qualify. A massive Sandy effect on PortSide was the stalling of our urgent search for a homeport. We need a place to fulfill our mission, earn revenue, and run programs. Resumption of real estate negotiations took many, many more months than we expected, and remains a major strain on PortSide. PortSide is now focused on the future while celebrating the good in recovery. Come join us in that spirit at our fundraiser on Tuesday, October 28 at Hometown Bar-B-Que. Join us in honoring our partners in Red Hook’s Sandy recovery: Victoria Hagman of Realty Collective, Danny Schneider the electrician, and Peter Rothenberg. Wear festive MARY WHALEN red and white. We look forward to talking with you there and, going forward, continuing the work we’ve collectively begun after Sandy in understanding our waterfront in all its complexity and potential! 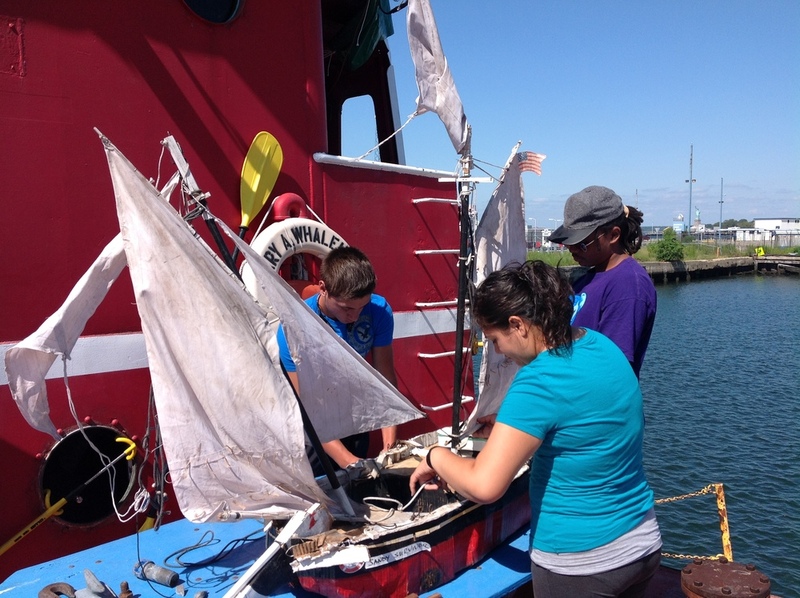 PortSide was founded to bring change to NYC’s waterfront, to make the waterways better used, to bring boats to communities, to change NYC policy. Thanks to our eight-year real estate search to create a place called PortSide NewYork, a home for our MARY A. WHALEN and visting vessels of all types, we have studied and/or negotiated with over 20 sites in NYC. This means we know where the opportunities - and the obstacles - are. We are funneling what we’ve learned to policy makers, and will soon start a public awareness campaign. The city has piers that are designated for boats that were not built well for boats. The city has rules that add other layers of impediments. Did you know that historic houses in NYC Parks have resident housekeepers, but New York City policy often prohibits resident shipkeepers who would similarly protect and maintain historic ships? Did you know that NYC has a policy that states “boats block the view”? Buildings face no such absolute prohibition. Building zoning is calibrated to building function, size, location. “Boats block the view” has kept our MARY A. WHALEN off several piers. We’re out to change that rule, and others. NYC has a reputation on the eastern seaboard for being a boat-unfriendly town. The thrust of NYC's first 20 years of waterfront revitalization, before Vision 2020, was getting people to the water's edge NOT onto, into or using the water itself. The impediments prevent non-profit and commercial marine operators alike. They prevent major maritime festivals and single historic ships from visiting NYC, and prevent NYC's own historic ships from easily moving around the city to serve the public. Such impediments limit dinner, charter and excursion boat options, community sailing programs, marinas, kayaking programs and the workboat sector of the industrial waterfront. Would you like more boats in your community? Summer ship camp? After school programs afloat? More maritime jobs? The chance to take a dinner cruise or leave on fly fishing cruise from your own neighborhood? Activity on a dormant pier in your neighborhood? Do you have a boat, boating program or business looking for a space in NYC? Leave us a comment below to let us know. Support our fundraiser on Tuesday 10/28/14 “Resiliency is our HOOK.” Buy a ticket. Become a sponsor. Join the Host Committee and help sell tickets before the event. It will be a fun event with the rollicking Dixieland jazz of the Red Hook Ramblers and the great food and casual ambiance of Hometown Bar-B-Que restaurant. We greatly appreciate your support! As do the people and businesses who benefit from our resiliency work! Help change NYC’s waterfront! Help us transition to a new home! 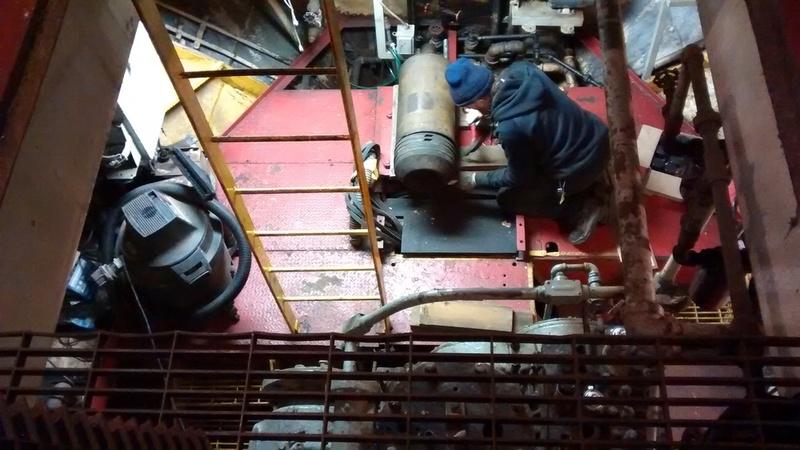 Work on a ship! Join the innovative non-profit PortSide NewYork, a leader in waterfront advocacy and programming. Our programs are a mix of maritime, preservation, forward-thinking urban planning, arts, education and community revitalization. With the transition to a new home in 2013, PortSide will create fundraiser events, launch an on-line campaign, and engage in community outreach. Interns will wear many hats during this exciting time. We seek dependable, organized workers for a small and social office. Enthusiasm for PortSide’s mission, and good research and writing skills are essential. Familiarity with Photoshop, Illustrator and/or InDesign and website/blog maintenance is highly desirable. A knowledge of boats or waterfront issues is a decided plus, but not required. Positions are unpaid. Send resume and availability via email. The ideal candidates will be able to contribute to several of the tasks outlined below. As we transition to a new home, fundraising and capacity building will be our priorities, but we will be looking to create programs that can comfortably be executed during this period of institutional growth. Interns will help plan events and execute outreach to potential new supporters, sponsors, program partners and venues; help launch a fundraising committee; be a liaison between all participants, set up meetings and conference calls; and help put out PR blasts about events and breaking news. Interns need to be organized and capable of tracking communication between many people over time. Programs are likely to include regular ship tours, some cultural events, and the creation of a new guide to Red Hook in both hard copy and web versions. Our 2013 transition to a new home and related fundraising means we will produce a lot of news, flyers, brochure updates and invitations. We seek a graphic designer to make those and to create a new version of our guide to Red Hook (PDF) which will aid Red Hook’s recovery from Sandy. An essential project is to help transition our website to an on-line design platform such as WordPress or Squarespace with better integration of our blog and Twitter feed. Intern will do pre-production work to help maintain PortSide’s blog, Facebook, and Twitter by researching some content, distributing Sandy recovery updates from the Mayor’s office, downloading and resizing photos. We would love an intern who has advanced Twitter skills. Intern will do some maintenance of our constituent database on Constant Contact. 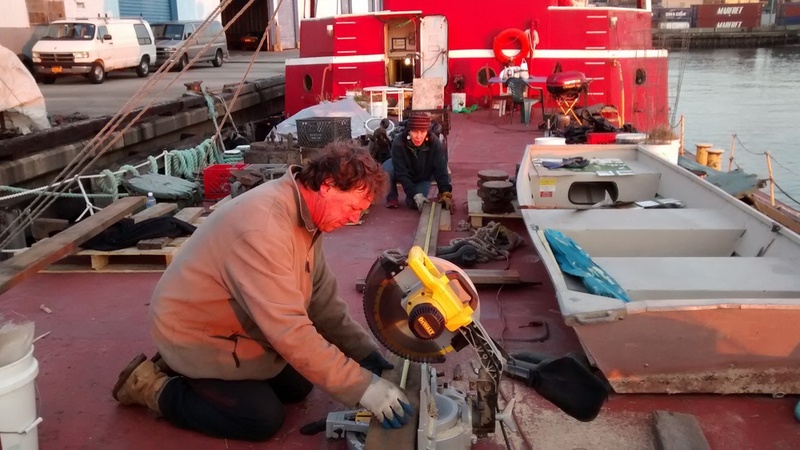 Tasks include research sources of funding for general support for PortSide (funding for capital, program and operating costs) conservation of MARY WHALEN logbooks, and our BoatBox project; updating our extant grant list; assisting staff in completing funding applications. Vote to fund the only boats in the $3MM grant competition from American Express and the National Trust for Historic Preservation that will fund sites in NYC! 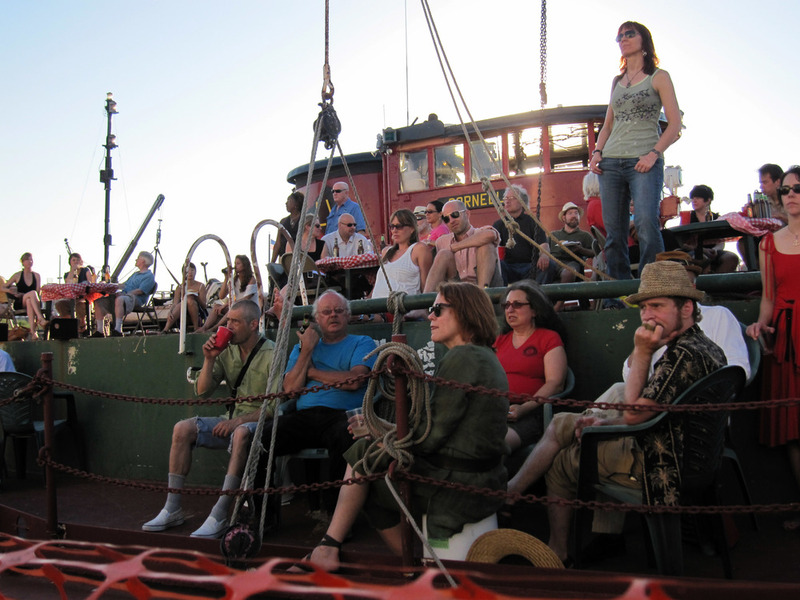 Vote for PortSide's friends and partners,the Tug Pegasus & Waterfront Museum Barge! Vote early and often! Seriously! Vote every day from April 26 through May 21 at www.partnersinpreservation.com so that these two great historic ships can win a share of the grant money. To make it easier to remember to vote AND to be eligible to win a July 4th fireworks cruise for two on the tug Tugboat Pegasus, visit the website of either the Tug Pegasus Preservation Project or the Waterfront Museum barge and sign-up to receive a daily reminder to vote and you will automatically be entered into the raffle. Support NYC’s floating cultural heritage. Vote for historic ships! Let American Express and the National Trust for Historic Preservation know that boats count! American Express, partnering with the National Trust for Historic Preservation, is committing $3 million in preservation grants to historic places in New York City through its community-based program, Partners in Preservation. Guaranteed funding of $250,000 goes to the top three places, so get voting! The tug and barge have been selected for this competition after a LONG process, so let's make it pay off! Additional grants will be awarded to a number of the other sites after review by American Express, the National Trust for Historic Preservation and an advisory committee composed of New York civic and preservation leaders.